NIA CHARLESTOWN NEVIS (MAY 28, 2015) — Security was a key matter at a meeting between Premier of Nevis Hon. Vance Amory and Ambassador Head of Delegation of the European Union to Barbados and the Eastern Caribbean His Excellency Mikael Barfod, at Bath Hotel on May 26, 2015. Mr. Amory described the meeting as one of useful discussions in which the Ambassador indicated keen interest of the European Union grouping to assist the Caribbean region including St. Kitts and Nevis where security is concerned. He said it was no secret the high priority which Nevis and St. Kitts and Nevis places on security especially in light of serious crimes that had taken place recently. The Premier thanked the Ambassador for his commitment to further discuss the matter with colleagues at the European Union Commission in an effort to provide any assistance they could. 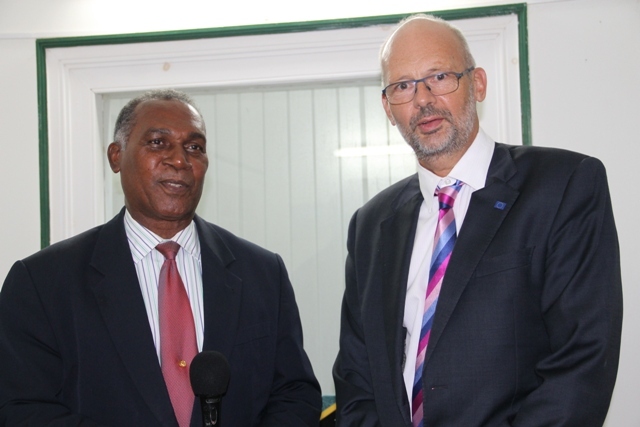 Mr. Amory stated that Nevis and the European Union had a long-standing relationship and pointed to the European Development Fund’s assistance with the reconstruction of the Alexandra Hospital and a previous water development project. He thanked the grouping for the assistance given to Nevis and also for the commitment of further assistance with development especially at a time when the issue of security is a priority. Meantime, the Ambassador stated he was impressed by the island’s environment and noted he now had a better understanding of the island’s security situation at the end of his meeting with the Premier. “I must say that Nevis has never been far away from my mind because I have met with you before and we discussed the economic situation in Nevis and your challenges and today was very interesting, I thought, because we managed to cover a wide range of issues from health, renewable energy and indeed security. “I understand the security situation in Nevis much better now, after haven spoken to you, than I did before and I hope we will be able, one way or the other, to assist,” he said. According to Ambassador the European Union is the biggest grant donor to the Caribbean region and St. Kitts and Nevis is no exception. He noted that most of the aid given to the Federation, was through budget support provided to the treasury. “I am of course extremely interested in how this money also benefits Nevis and that is something that will be on our agenda with the Federal Government. I hope to basically understand this much better for the future and for the benefit of Nevis,” he said. The Ambassador also use the opportunity to invite officials from Nevis to visit him whenever possible, in an effort to discuss areas of mutual interest in which the European Union could assist.